The government of Myanmar is putting great emphasis on transforming the current education system of the country with the help of public sector and several international organizations such as World Bank and the European Union. The government has identified education and health as two key parameters to attain the upper middle-income country status by 2030. Improvement in the education enrolment rate and development of commercial sector in the country would help the Myanmar stationery market to register a healthy growth over the coming years. According to 6Wresearch, Myanmar stationery market size is projected to grow at a CAGR of 11.4% during 2018-24. The government has launched the National Education Strategic Plan (2016-21) initiative that focuses on the overall development of the education systems of Myanmar. Further, from academic year 2017-18, the country would adopt K-12 education systems under the National Education Law and would extend schooling by 2 years. This would lead to an increase in demand for stationery products in the country as more number of students would be enrolled in schools. Additionally, paper stationery products such as executive notebooks and copier papers captured majority of the Myanmar stationery market share in 2017 on account of heavy demand from both education and office segments. Pens and pencils are the most popular products in non-paper stationery segment, being used in daily writing tasks in both official and education sectors. The education segment holds majority of the revenue share in the country's overall Myanmar stationery market as both paper and non-paper stationery products are heavily used by school and college going students. 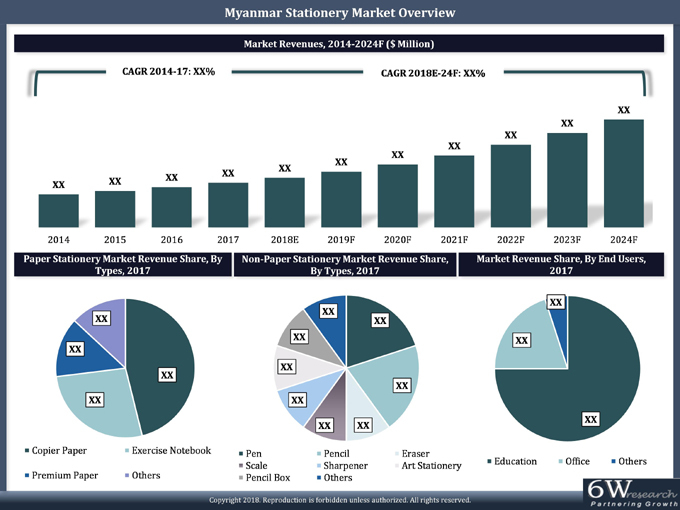 The Myanmar stationery market report comprehensively covers the Myanmar Stationery Market by types, price category, applications and regions. The Myanmar stationery market outlook report provides an unbiased and detailed analysis of the Myanmar stationery market trends, opportunities/high growth areas and market drivers which would help the stakeholders to devise and align their market strategies according to the current and future market dynamics. •	Historical & Forecast data of the Global Stationery Market Revenues for the period, 2014-2024F. •	Historical & Forecast data of Myanmar Stationery Market Revenues for the period, 2014-2024F. •	Historical & Forecast data of the Myanmar Paper Stationery Market Revenues for the period, 2014-2024F. •	Historical & Forecast data of the Myanmar Copier Paper Market Revenues & Volume for the period, 2014-2024F. •	Historical & Forecast data of the Myanmar Exercise Notebook Market Revenues & Volume for the period, 2014-2024F. •	Historical & Forecast data of the Myanmar Notebook Market Revenues & Volume for the period, 2014-2024F. •	Historical & Forecast data of the Myanmar Drawing Book Market Revenues & Volume for the period, 2014-2024F. •	Historical & Forecast data of the Myanmar Other Notebooks Market Revenues & Volume for the period, 2014-2024F. •	Historical & Forecast data of the Myanmar Diary Market Revenues & Volume for the period, 2014-2024F. •	Historical & Forecast data of the Myanmar Other Paper Stationery Market Revenues for the period, 2014-2024F. •	Historical & Forecast data of the Pen Market Revenues & Volume for the period, 2014-2024F. •	Historical & Forecast data of the Pen Market Revenues & Volume, By Types for the period, 2014-2024F. •	Historical & Forecast data of the Pencil Market Revenues & Volume for the period, 2014-2024F. •	Historical & Forecast data of the Pencil Market Revenues & Volume, By Types for the period, 2014-2024F. •	Historical & Forecast data of the Eraser Market Revenues & Volume for the period, 2014-2024F. •	Historical & Forecast data of the Art Stationery Market Revenues for the period, 2014-2024F. •	Historical & Forecast data of the Scale Market Revenues & Volume for the period, 2014-2024F. •	Historical & Forecast data of the Pencil Box Market Revenues & Volume for the period, 2014-2024F. •	Historical & Forecast data of the Sharpener Market Revenues & Volume for the period, 2014-2024F. •	Historical & Forecast data of the Files and Folders Market Revenues for the period, 2014-2024F. •	Historical & Forecast data of the Adhesives Market Revenues for the period, 2014-2024F. •	Historical & Forecast data of the Technical Instruments Market Revenues for the period, 2014-2024F. 14.5 Linc Pen & Plastics Ltd.
14.6 DOMS Industries Pvt. Ltd.
14.7 Staedtler Mars Gmbh & Co.
14.8 Yangon First Stationery Co. Ltd.
14.10 New Century Paper Industry Co. Ltd.
14.11 Mitsubishi Pencil Co. Ltd.